Asmodus Pumper-18 BF Squonk Box Mod is constructed out of high-quality 6063 Aluminum Alloy frame and stabilized wood body inlay for a visually stunning display. The cut-out section houses a 7mL squonk bottle for convenient utilization with BF RDAs and it comes with a unique squonk-ready pump mechanism. 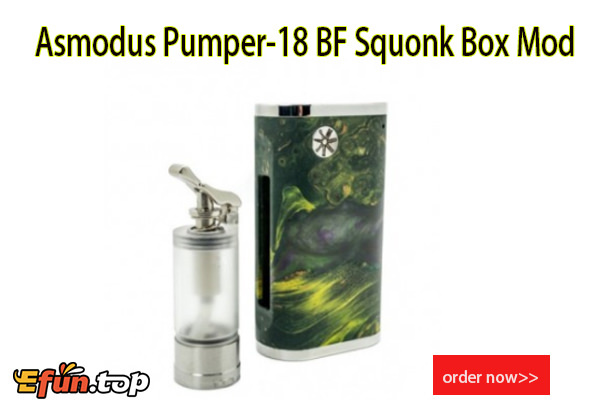 Powered by a single 18650 battery (not included), the asMODus Pumper BF output level depends on the current state of the battery, and shut off when the battery reaches 3.3V.